Nikolai is a blue silver tabby point neva masquerade Siberian of excellent type imported from Serbia. Thank you to Ana Mitic of Neva Angels Cattery for entrusting me with this beautiful cat. His parents are both quadruple international grand champions. Nikolai has a wonderful sweet temperament and a very gentle nature in contrast to his massive size. He loves to play catch and if you throw him a ball of paper he will happily retrieve it over and over again. He is also a wonderful lap cat and enjoys purring whilst snuggling on your lap for as long as you like. He will rest his head on your shoulder. He also loves to lay on your tummy or chest and gives wonderful massages kneading with his paws and making biscuits. When you come home or whenever he sees you he will always greet with a friendly Meow. 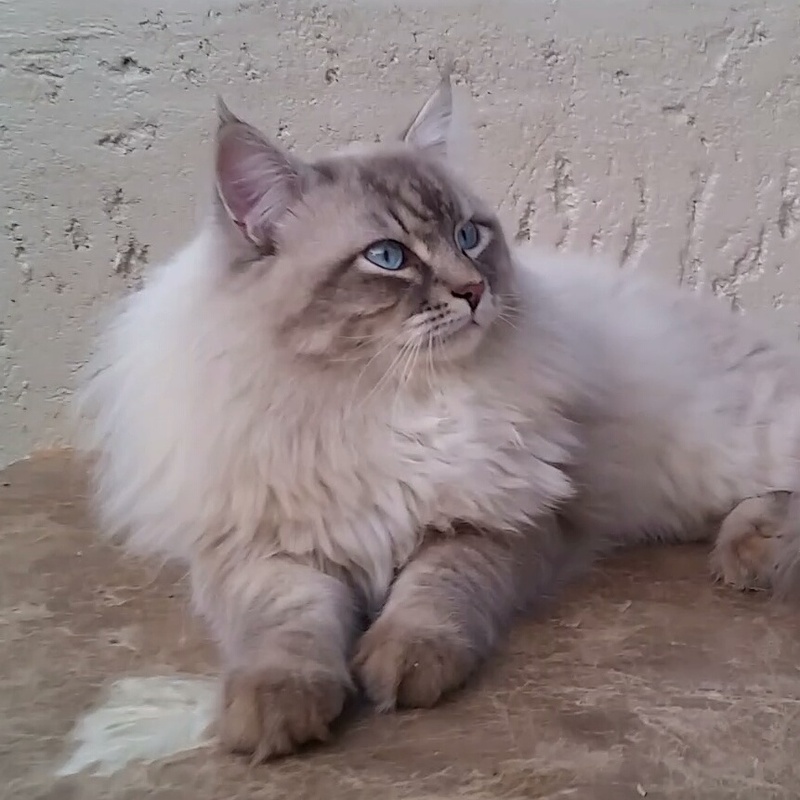 Anastasia is a seal tabby point mitted Neva Masquerade cat with a loving, tender nature imported from Russia. She is a very graceful cat with a slinky and elegant gait, a real femme fatale. Pure class is what I think of whenever I see her. Thank you to Anna Kolegova of Nord Grace cattery for the opportunity to have one of her exceptional cats in my breeding programme. Anastasia's parents are also both international grand champions. Anastasia has a very soft, high-pitched and endearing voice. Her meow is very sweet. At the same time she has a very satisfying purr that is like a deep rumble. Anastasia has never ever scratched me with her claws. She is such a gentle girl and is simply incapable of using her claws against a person. Eila has exceptional and rare colouring. She is a beautiful blue golden Neva Masquerade. She is the first golden Neva Masquerade to be imported into Africa. Eila comes from excellent Polish bloodlines of Neva Masquerade cats. She is a real bundle of energy and loves to play. She is curious about everything and is very brave. She enjoys the occasional wade into our fishpond looking for fish or anything that interests her in the water. She absolutely adores the water. She is an exceptional cat. Eila is also a real hugger and loves being carried around to observe the daily goings on from a high vantage point. Try putting her down while you have been doing this and she will literally hold on to you. Thank you so much to Beata Kurek of Cattery Kropla Nieba for this stunning girl. All our cats have excellent pedigrees data and wonderful temperaments. I am grateful to their breeders for their help and support in introducing Neva Masquerade cats of such excellence into South Africa. Despicable Me affectionately known as Nikolai. Even as a kitten he is very regal as befits his superb pedigree. Anastasia as a kitten. Exceptional fluffy coat and very tender, affectionate nature. Eila's colour is quite rare - currently the only golden Neva Masquerade in Africa. This beautiful boy is Elrond Lunnaya Dymka from Lunnaya Dymka cattery in Russia. We are delighted to have him in our cattery. He has a wonderful temperament which is the most important trait to us in our breeding - a very friendly boy with a relaxed nature, always ready for belly rubs and if you pick him up his strong, muscular body turns to jelly. He is a large, heavy boy whose beautiful blue eyes will melt your heart.